Noted as “fashion’s biggest night out,” the Met Gala always thrills with unique style -- I'm talking some cray cray stuff! It welcomes celebrities and young creatives for a fundraising benefit for the Metropolitan Museum of Art in New York City. The Met Gala 2018 also signifies the highly anticipated grand opening of the Costume Institute’s annual fashion exhibition: “Heavenly Bodies: Fashion and the Catholic Imagination” opening on May 10, 2018. 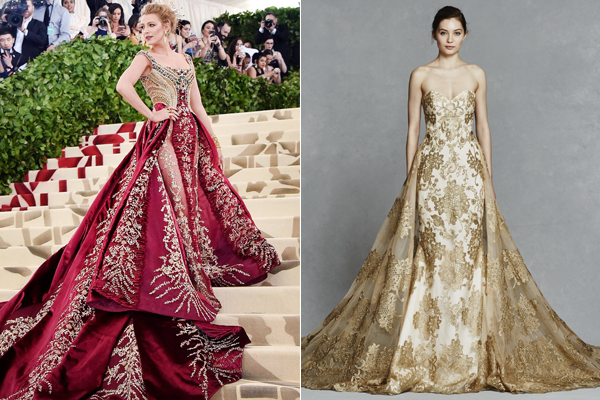 Here's a look at some of our favorite looks from the red carpet and inspired wedding-worthy dresses that you'll love! Blake Lively's Versace gown reportedly took over 600 hours to create. Let's just say it was definitely a show stopper! You'll turn heads too in our gold GWENDELYN gown. 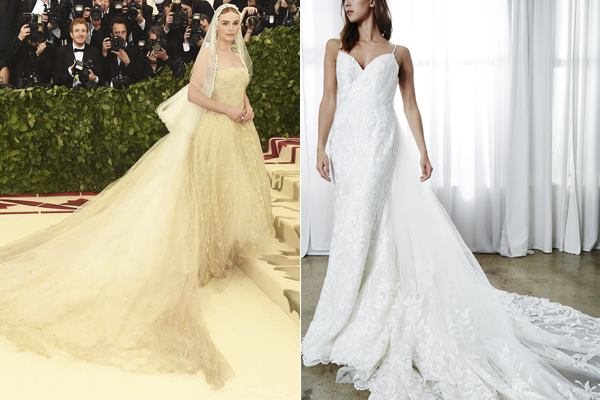 Kate Bosworth paid an angelic homage with her Catholic-inspired gown, but GISELLE is no angel! We've got your "something blue!" Like Donatella Versace in one of her own creations, STAR will make you feel like royalty. Black and white design details are a modern option for any bride. 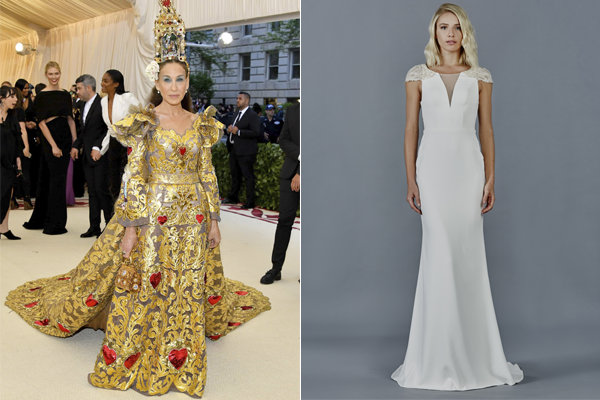 Like Lily Collins' Met Gala gown, CLEO is anything but boring! Slim, sleek, sleeves are fuego right now. Amber Heard is proof! JADE will show off all your curves and seaming details create length. Amal Clooney has become a fashion icon and so will you in TAYLOR. This detachable skirt transforms your look from whoa to WOW! More like fabulous feathers! Channel your inner Gigi Hadid in MACBETH. This ostrich feather skirt is bold and beautiful. 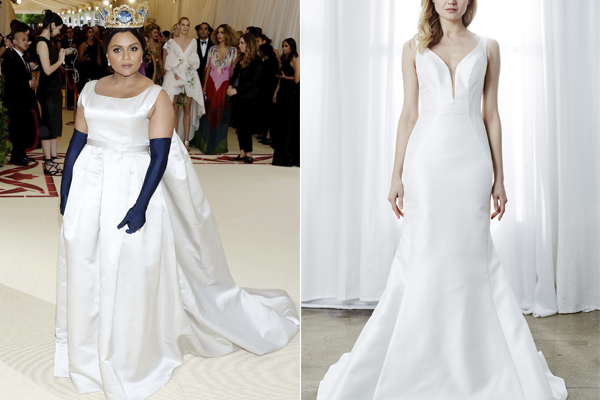 Sleek and classic is the only way to describe Mindy Kaling's silk frock. Love this look? Then you have to try our JULIENNE gown! You'll feel like a modern day princess. What's not to love about SZA's pink beaded ball gown? Frothy tulle skirts are brilliant because you get the fullness without the weight! Seriously, STAR is light as air.